When I was really little I would talk about horses non stop. My mom and dad decided to get me a riding lesson. I rode a horse named Paco. He was ginormous. I could barely get on him! He was a bay horse with a black mane and tail. I rode him for a long time. After about 2 years I switched to a horse named Poco. He is not actually my horse, I just lease him. We are best buds. Now that I am older I don't have as many lessons. But that's because I work at the barn. He is a bay with a black mane and tail too. We do a lot together. 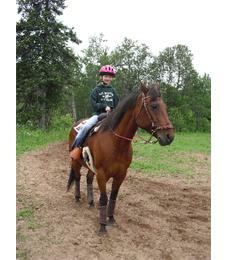 Last summer we did this trail ride called Sally's Ride. You go on it with a lot of other people. At the end everybody cantered to the rest of the trail. The trail ride is at the Marquette County fairgrounds. It is really fun. I'm also in the U.P.Riders 4-H club. Every year we have a 4-H kick-off where all of the 4-H members get together do alot of fun activities. Poco is a retired speed event horse so he can go pretty fast. Poco's owner is my riding instructor and the funny part is that she always runs Poco in the speed events there. And after she was done I took Poco in the Dizzy Cowboy race and he bolted to the end of the arena were I get off. I ride another horse named Rain. I don't lease her. She is really tall. Last summer we did the Alger County Fair. I was going to ride Poco but he had a little accident with his eye, so I didn't bring him. I brought Rain. First we did Horsemanship (I got third ), then we did showmanship (I got 3rd), and last we did walk trot (I got 1st). The next day we did team penning (my team got 1st). No matter what horse it is I will always love horses. Cool I really like your horse!